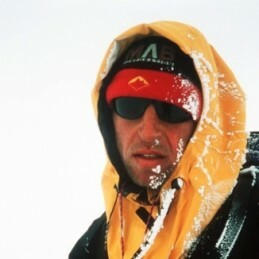 In May 1998 Peter Bland fulfilled his lifetime ambition, becoming the first Australian ever to walk to the North Magnetic Pole, and part of a select group to have visited both the North and South Magnetic poles. What makes Peter even more exceptional is that he has twice undergone major heart surgery. Despite these obvious setbacks, Peter’s determination and vision enabled him to overcome the odds and reach the North Pole while raising funds for the National Heart Foundation. Peter faced his perhaps biggest challenge in January 2001. Peter and fellow adventurer Jay Watson were attempting a world-first unsupported crossing of the Antarctic Peninsula when catastrophe struck. Caught by an avalanche, he plunged 40 metres down a crevasse, Peter suffered a fractured skull and severe brain trauma. Jay, a friend since boarding-school, kept him alive for three days deep within the crevasse until help arrived. Suffering severe brain trauma, Peter required a year of speech therapy, physiotherapy and ongoing medical attention before he could function normally again. Today, Peter Bland runs an adventure travel company specialising in teaching leadership skills to groups in the board room and then taking them to the ice to put their newly learned skills into practice. Peter Bland has also raised more than $14 million for Australian charities, produced two television documentaries and released his biography A Step Too Far.